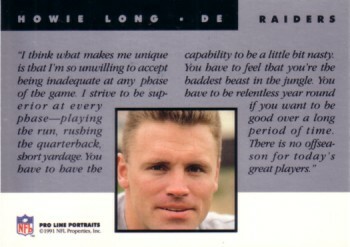 1991 Pro Line unnumbered promo card of Raiders Hall of Famer Howie Long distributed exclusively at the National Convention in Anaheim. These cards were produced for Howie to autograph at a private party at which time they would be embossed with the 1991 National seal, and the unused cards were supposed to be destroyed. These survived. The card number is NOT erased as the gloss on the bottom right corner is intact.